A stressful night, whoever thought that having matches on the last day of the window was a good idea, needs castrating. Still although the match was lost, Saints got their man, announcing the signing of Italian Manolo Gabbiadini on a four and a half year contract at the final whistle. Before the match we saw that the CB pairing was going to be Yoshida and Stephens and I guess that will now be the case, until van Dijk returns from injury, as there was ultimately no signing of a CB to cover the glaring gap that we can all see. It now appears that Saints were close to signing at least two CB's, only to balk at the wage demands of the players. Such are the problems of going shopping in the January window. This was an error strewn match from Saints and although they applied a lot of pressure, Fabianski in the Swansea goal was hardly troubled. On the other hand, when Swansea came forward, they looked far more threatening and Sigurdsson in particular, was causing all sorts of problems down the Swansea right. It was an odd performance, as even the usually reliable Romeu was looking unconvincing and indeed, it was an error from him that led to Swansea's first goal in the 38th minute. 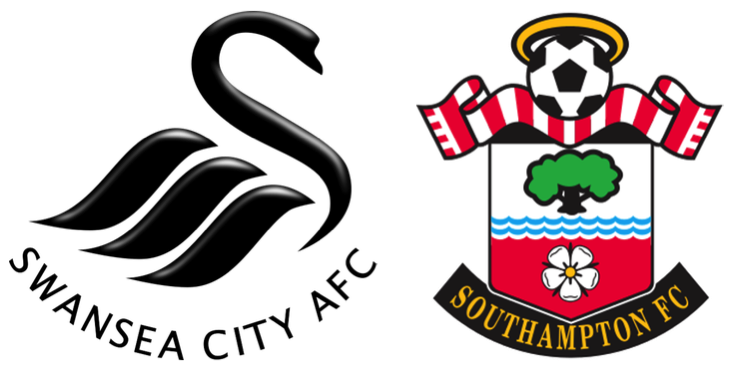 Up until that point it had been an encouraging performance from Saints, but as we have seen several times recently, if they don't score early, then they seem to lose confidence quickly. And yet we have performances like the Leicester home game recently where the team looked dynamic and well up for it. Tadić, the Northam favourite, was a good example of the inconsistency, impressive against Leicester, he was just a passenger in this game, right up until he was replaced by Boufal in the 56th minute. I also don't think that the midfield trio of Romeu, Davis and Clasie really work together that well. Clasie in particular looked a bit of a lost soul in this game, rushing things and generally charging around to little effect. Whisper it, but I think Ward-Prowse is far more effective. I think that he is now turning into the player that was expected, when he made his first team debut in a League Cup game against Crystal Palace in 2011. On this night though, the first goal for Swansea on 38' was given to Mawson, but I thought for an instant that it was an own goal by Romeu. Looking at it again, it was clear that the Spaniard had lost his man and Mawson was essentially unmarked and had a simple task to score. Seems easy when you say it that way, but Redmond had an equally straight forward chance up the other end of the pitch, from no more than eight yards out, but actually manage to send the ball for a throw-in on the far side of the pitch! Laughable. So, 1-0 at half-time and the visitors had the lion's share of possession, but had done little with it. The second half began and it was clear that Tadić was no more interested in the game than Nigel Farrage is interested in remaining in Europe. Puel hauled him off and replaced him with Boufal, recovered from his African Cup injury. Suddenly Saints had a creative attacking outlet and Boufal showed why Saints signed the French Moroccan. He was excellent for the rest of the match. The equaliser from Shane Long came within a minute of Boufal's appearance and that was no coincidence. I thought that Saints would now go on to win the match, such was the transformation. Unfortunately the old insecurities were still lurking under the surface and Stephens was lucky to get away with a clear penalty for handball, before that man Sigurdsson tortured Saints one last time by scoring the winner in the 70th minute. Suddenly Saints looked more purposeful and laid siege to the Swansea goal. It made you wonder why they hadn't played like this before. However, it was too little, too late and they ran out of time. I thought that ultimately a draw would have been a fairer result, but at least we saw Boufal (A clear Saints MoM) at his best and I am sure that he will get better as the season goes on. With the added promise of Gabbiadini, I think that we may see a few more goals from the forwards. Balanced against that is the CB situation. We need van Dijk back, absolutely as soon as possible.